The moral acceptability of a clinical trial is rooted in the risk and benefit for patients, as well as the ability of the trial to produce generalisable and useful scientific knowledge. The ability of a clinical trial to justify its claims to producing new knowledge depends in part on its ability to recruit patients to participate—the fewer the patients, the less confident we can be in the knowledge produced. So when trials have recruitment problems, those trials also have ethical problems. In a recently published issue of Clinical Trials, my colleagues and I investigate the prevalence of poor trial accrual, the impact of accrual problems on study validity and their ethical implications. We used the National Library of Medicine clinical trial registry to capture all initiated phase 2 and 3 intervention clinical trials that were registered as closed in 2011. We then determined the number that had been terminated due to unsuccessful accrual and the number that had closed after less than 85% of the target number of human subjects had been enrolled. 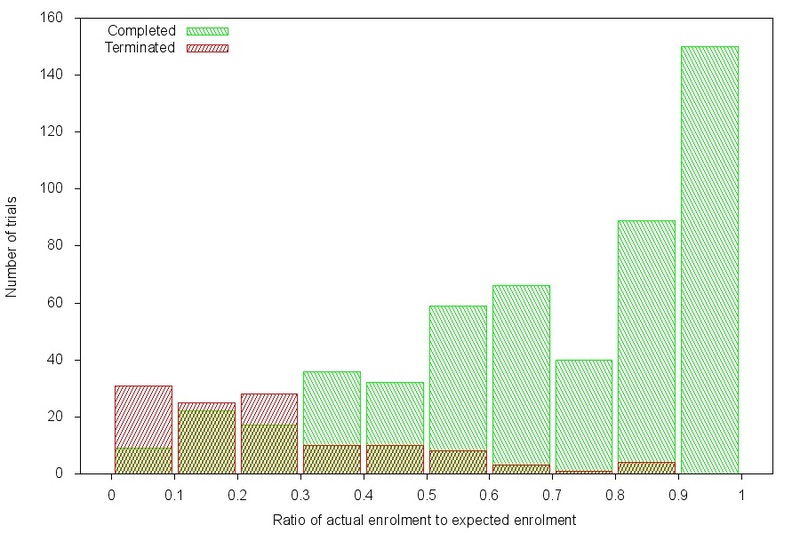 Of 2579 eligible trials, 481 (19%) either terminated for failed accrual or completed with less than 85% expected enrolment, seriously compromising their statistical power. A total of 48,027 patients had enrolled in trials closed in 2011 who were unable to answer the primary research question meaningfully. Not only that, but we found that many trials that should have been terminated were pursued to completion, despite flagging rates of subject accrual, and the proportion of trials that completed was much higher than the proportion of trials that terminated, even at accrual levels as low as 30%.